Legal Tender is the first publicly accessible online tele-robotic laboratory. 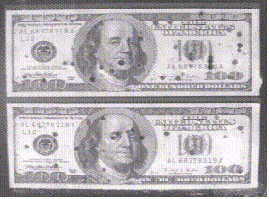 Remote viewers are presented with a pair of purportedly authentic US$100 bills. A remote viewer can participate by giving up their anonymity and agreeing to accept full responsibility for their actions. They are furthermore reminded that it is a Federal crime to deface US currency. Whoever mutilates, cuts, defaces, disfigures, or perforates, or unites or cements together, or does any other thing to any bank bill ...shall be fined or imprisoned. 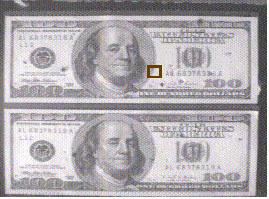 Users are then given exclusive access to a small portion of the bill (see square on bill pair above) along with a high resolution magnified view (see image on top right above). The participant can then choose to perform an experiment on their area of the bill. After selection, the experiment it performed via a remote robotic system and the results shown. A puncture test is shown at the top of the page and a thermal test below.